The Light Cave is an installation by FriendsWithYou outside of The Standard Hotel on The High Line in New York City. FriendsWithYou is made up of two artists Samuel Borkson and Arturo Sandoval III. The cave is bright colours, and lights up at night. 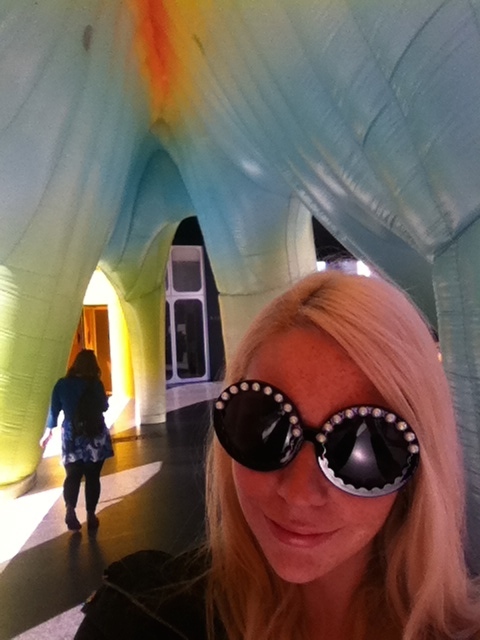 It is inflatable, as are many of the artists past installations. “On a very physical level, once you’re inside of it, and when you’re being affected by the hues of it, I think it creates almost, like, a reunion, in a very loose, metaphysical sense,” Sandoval said. “You are connected now because you’re in this thing.” Aurturo said in an interview with Vanity Fair. FriendsWithYou often work with spiritual themes, and the experience aims to created a sense of connectedness not unlike one experiences when visiting a place of worship. In creating the work, FriendsWithYou have said on social media that they were inspired by churches, temples, mosques, elephants, and stonhenge. The exhibition was commissioned by Art Production Fund and The Standard Hotel. Yesterday I had the pleasure of visiting, and it certainly did evoke feelings of connectedness and it is just as bright in the day time! Go visit it if you have the chance, it is on until October. Hi blogger, do you monetize your website ?